Just a heads up to fans of hardboiled noir cinema. If you subscribe to TCM, here in North America you can see a triple-header of Mike Hammer films tomorrow May 6, 2011. First up at 8:00 PM EST is the brilliant Kiss Me Deadly (1955), an adaptation that elevates the original novel to a cold war thriller. The mysterious glowing suitcase that appears near the film’s finale is an image that gets reused by filmmakers, notably in Alex Cox’s Repoman (1984) and Quentin Tarantino’s Pulp Fiction (1994). Then we get My Gun is Quick (1957) at 10:00 PM and finally author Mickey Spillane inhabits his creation Mike Hammer when he stars in The Girl Hunters (1963) at 11:45 PM. Unfortunately missing from the list is the first and rarely seen Mike Hammer film adaptation, I, The Jury (1953), starring Biff Elliot as the tough as nail Mike Hammer and incidentally photographed in 3-D an directed by Harry Essex, a man with even more ties to the 3-D boom of the fifties. He served as a screenwriter for two other 3-D classics, It Came From Outer Space (1953) and The Creature From the Black Lagoon (1954). I’ve included some screen grabs of a very self-aware 3-D film moment. 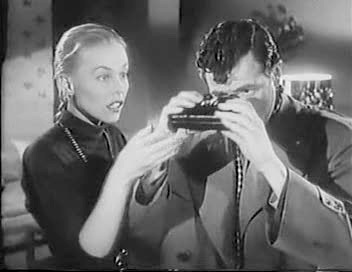 Mike Hammer (Biff Elliot) looks through a stereoscope. What Mike sees... the Belamy sisters played by Tani Guthrie and Dran Hamilton.